Mix all the ingredients together and spread between 2 sheets of paper. Cut into moon shapes and circles, bake on a silpain at 170°C. Melt the butter, mix it with icing sugar followed by the yuzu puree, egg whites and finish with the flour. Shape and bake at 170 °C. Bring the water and sugar to the boil with the used vanilla pods. Add the juice of the used oranges. Spread and bake at 170°C. Remove the zest of an orange and cut into thin strips. Blanch 4 times and leave in the hot syrup. Warm the juice and the purees with the vanilla and pour in the powders. Bring to the boil and mix the syrup with the mixed yoghurt. Churn and set aside in a paco bowl. Mix the yoghurt, vanilla and honey with the melted gelatine mass, then stir into the whipped cream. Cut out 20 supremes (segments) from 2 oranges. Mix the praline and the oil. Keep aside in a piping bag to assemble the cake. Bring the milk, cream, sugar, pectin, glucose and praline to the boil then add the gelatine mass. Add water if necessary and refrigerate. Ice the dessert at 35 °C. Make a custard with the cream, egg yolks, vanilla and sugar at 84 °C, pour over the gelatine mass and mascarpone. Process in paco twice before serving. Bring the ingredients to the boil together. Pour into the mould and the remaining jelly in a bowl. Set the moulded shapes aside to cool then refrigerate. Mix the remaining jelly and set aside in piping bags. Roast in the oven at 170°C for approximately 10 minutes. Pipe out a jelly moon shape on the plate. Place the iced dessert on top and coat with caramelised pecans. On the moon, place a shortbread and pipe out dots of vanilla mascarpone cream, jelly, orange strips, wafers, pecan, orange supremes and a quenelle of sorbet. 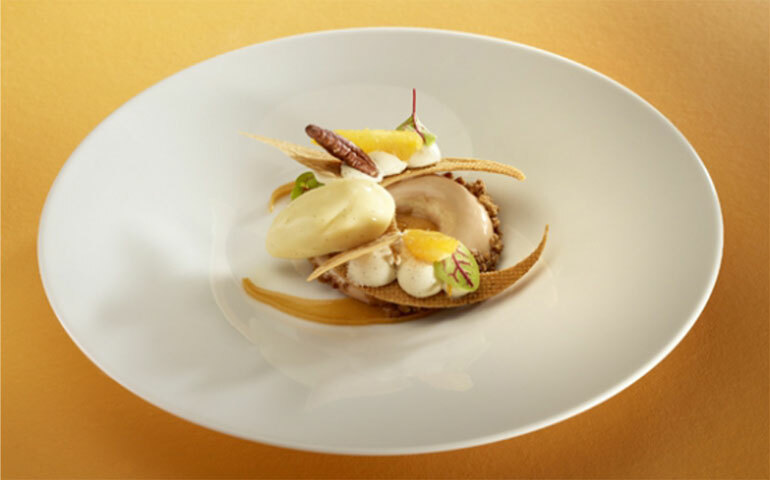 Place the filled moon on top of the dessert and finish with 3 vene cress.